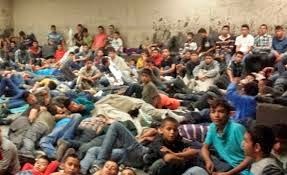 Bluegrass Pundit: Unbelievable: Mexico makes agreement with Guatemala to ease passage of illegals traveling to U.S.
Unbelievable: Mexico makes agreement with Guatemala to ease passage of illegals traveling to U.S. It's time to cut off all aid to Mexico, Guatemala, Honduras and El Salvador until this ends and they take back their citizens. The Southern Border Program to Improve Passage, will provide for more border checkpoints along Mexico's border with Guatemala, and offer more protection and even emergency medical care to those making their way north. The illegal aliens will receive a so-called Regional Visitor's Card, according to El Universal. Officially, the program will grant the cards to only illegal aliens from Guatemala and Belize, allowing them to remain in Mexico's southern states for 72 hours (more than enough time to reach the U.S./Mexican border by train). While, those two countries share a border with Mexico, the program will undoubtedly benefit anyone who makes it to the border, which would explain why our Border Patrol stations are currently overflowing with illegal aliens from El Salvador and Honduras as well.